"I liked the fact that the class was presented in an easy and relatable manner (ie. everyday, everyone issues)." "This class taught me a lot about anxiety and the mental process. It taught me to relax and be mindful of my thoughts. The meditation class was my favorite!" "I liked learning breathing techniques and the relaxing yoga poses. Thank you! Daniele is amazing." "The meditations were clear and I was able to get it. This class is calming, peaceful, and loving. I am struggling with the past and forgiveness, so this class is helping, but I expect it will take some time." "I always feel so peaceful and grounded, ready to go. I love the variety, the images, openness, the connectiveness...on and on! I always want to come back. With so much gratitude! "Very welcoming, relaxed atmosphere, no judgment. Felt comfortable to meditate with strangers. The class went by too fast. The class helped quiet my mind, it reminds me to live consciously and be more present in my daily activities and interactions with others." "I liked that this class helped me to start meditating by myself. It helped me to stop and do it. More calming, more in tune with myself." "The instructor was warm, genuine, respectful of participants, good sense of humour. These qualities assisted a rather diverse group to work, together and separately. The class helped me see the value of meditation, to create times of inner quiet and focus, and to appreciate how this might also affect a family member. The class always went quickly. The handouts were useful, well-written, clear, a good way to practice techniques learned in class." "It is much easier to meditate at home now, been trying to meditate for 3 years, now I have a technique that works. I loved the techniques that I didn't know were techniques. I gained insight into my life. I can communicate with my inner spark. I understand more what "they" expect of me." "I felt very relaxed and calm, and full of positive energy. I liked everything! This class helped me be more aware of my thoughts and learn how to manage my emotions. Thank you for sharing your knowledge." "I learned a different way of thinking about things. This class helped me stay focused." "The class felt comfortable and enjoyable. The class helped me relax, breathe, and let go of issues." "What I liked the most about this class is learning to love myself and accept others as they are." "I liked the messages - very powerful integration of movement with the message. I liked it all." "I liked the symbolic nature. Applying symbolic feelings and situations to yoga poses. This class really helped me forgive past tensions in my life." "I can't believe I have been taking yoga classes with Daniele for almost 3 years! I remember when I started, I was so out of shape, I did not think I would ever be able to do all the yoga positions, and here I am today doing downward dog with no problem at all. I have enjoyed the balance of the physical and spiritual journey, I don't think I would get that with an instructor through a gym or with a program with the township. I look forward to more classes with Daniele as my guide." "I've been enjoying yoga with Daniele for almost 3 years. Her style of yoga provides a very special blend between the physical movements and spiritual meditation that optimizes my well-being. Her yoga practice is always different based on themes which keeps me very motivated. The benefits I obtain on the physical aspect are more flexibility, greater strength, and no more arthritis pain in the joints, to name a few. While the yoga nidra has provided me with incredible inner peace and calmness, it has taught me to meditate and to bring my blood pressure to a normal level. No matter how stressed or anxious I am before yoga, I always walk out from it feeling so peaceful and calm, just like walking on clouds. Yoga with Daniele has helped me regain my health back therefore moving forward, it will always be a very important part of my life. Thank you so much for helping me better my life, you're amazing!" "I've been taking Daniele's yoga classes for almost a year now, and I can't say enough great things about her and the class. She truly customizes each of her classes based on the needs and wants of the participants, and I really like the class size and individual attention that comes from this. Since starting yoga with Daniele, it's truly changed my life for the better in many ways. 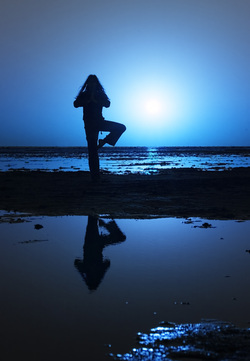 The knowledge and techniques I have learned from taking her class have carried over into many aspects of my life and have helped me achieve a more balanced and peaceful life. I also especially love the class "themes" each week which she puts great thought into." "I'm 56, never tried Yoga before and I'm loving it. In our small personal sessions, Daniele encourages us to do what our body is comfortable with, it doesn't matter what the person on the mat next to us is able or not able to do, feel your own body. After the class I feel soooo limber, relaxed, and ready for a great day. I have used her breathing techniques quite a few times to relieve tension. If you have never tried Yoga, like myself, I highly recommend Daniele as your instructor. I have been taking her classes for 5 months so maybe now I can be called a "Yogi"."